I'm organising the next London Urban Sketchers' Sketchcrawl. 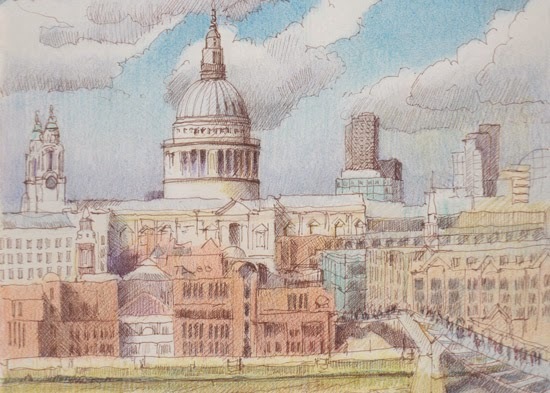 You can find all the details and maps and some suggestions of possible subjects or views to sketch in this post Let's Draw St Paul's to the Thames - 26th April 2015 on the Urban Sletchers London blog. Everybody is welcome - the only requirement is that you stick to the terms of the manifesto (see end). I usually have a sit down half way through a Private View, pull out my sketchbook and my favourite Pentel G-TEC-C4 gel ink rollerball in brown ink and have a quick sketch with my cup of tea. I'm into line sketching at the moment - no shading, no colour, just line. You can read about the 203rd Annual Exhibition of Royal Institute of Painters in Water Colours #1 - Prizewinners and Events on my main blog Making A Mark. 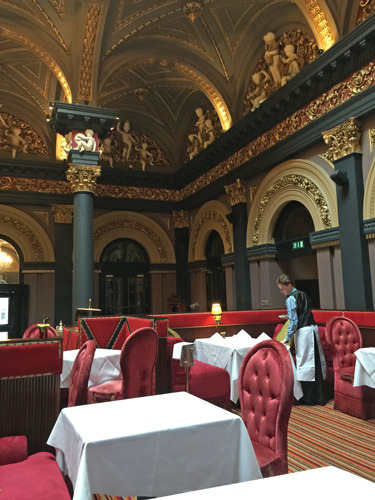 After I had finished my talk and panel discussion last Thursday I took myself and my travel sketchbook off to The Merchant Hotel. This is a 5 star hotel which houses The Great Room Restaurant in what used to be the Banking Hall in the Headquarters of the Ulster Bank in Belfast. 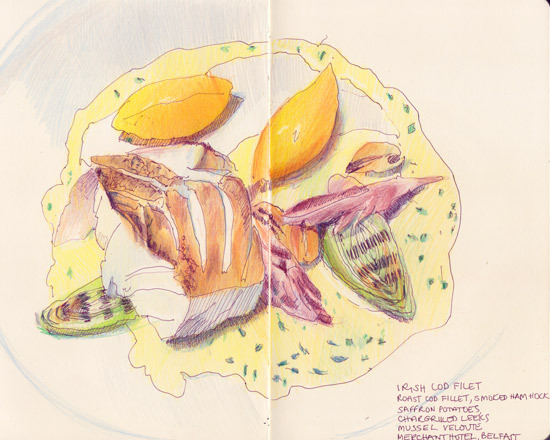 As many of you know I'm very fond of sketching food and in particular nice meals in different parts of the world. I arrived about 1.30 and the restaurant was full. At first, it seemed unlikely I would be able to get a seat. However keen to enjoy some fine dining and a wealth of things to sketch I persisted and was rewarded with a table. The banquette was very comfortable and the service was extremely high quality after a minor hiccup. So here - in order - are my sketches and a photo or two. 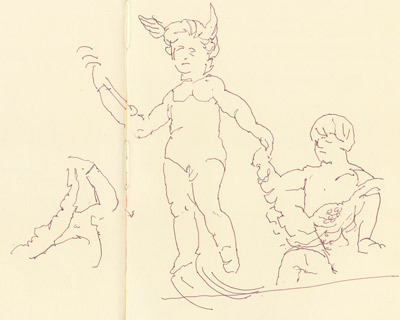 First my sketch of the cherubs decorating the tops of the walls around the room. I decided I liked the one with wings coming out of his head! This was a beige colour - but delicious! Next course was a dish of Roast Irish Cod Fillet with Ham Hock. and finally... my dessert - White Chocolate Parfait. I didn't get round to sketching my cup of tea at the end of the meal - due to the need to get to the airport - but it was beautifully served. 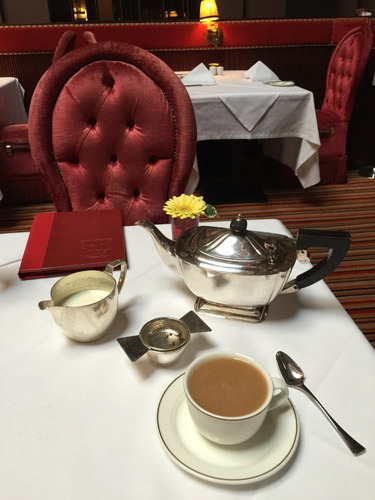 You can find The Merchant Hotel in Waring Street, Belfast in the Cathedral Quarter. You can find out about the history of the building here. 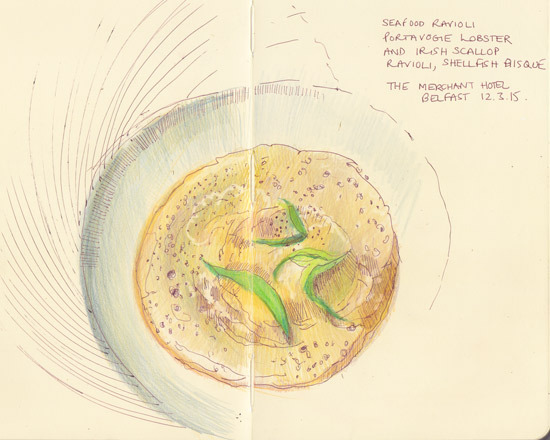 One of the highlights of my recent visit to Belfast for the Ulster Festival of Art & Design was the food which can be enjoyed in the vicinity of the Faculty of Art & Design. On Wednesday lunchtime I enjoyed Fish and Chips while sat in a booth next to Dara Ó Briain at the Canteen at the Mac (I sleepwalked past!). The Mac is a new arts venue in Belfast - behind the Art School. It has fabulous looking and tasting food (here's the lunch menu). It tastes even better when you've had no breakfast because you were up so very early to catch a plane to Belfast! Then on Wednesday evening after my talk, Julie Douglas and I met up with John Angel and his wife Megan and we went for a late dinner at Coppi in St Anne's Square, behind the Cathedral. 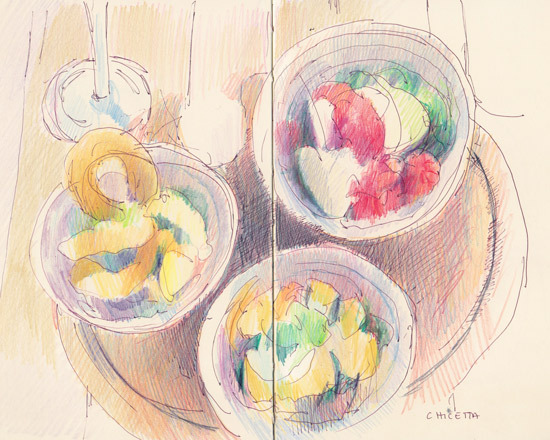 I did a super fast sketch of the Cicchetti I had for a starter - and then had a go with colour when I got home. Very tasty! I followed up with Pork Saltimbocca Prosciutto, Roast Chestnut, Sage Butter & Bitter Leaf Insalata - but was too tired to sketch by this stage! Cicchetti (pronounced “chee-KET-eeh”) are small dishes of food - not unlike Tapas - but Italian in origin and typically served in traditional "bàcari" in Venice. Plus I do like a restaurant which goes to the trouble of telling you which dishes are vegetarian, gluten free, contain nuts etc. 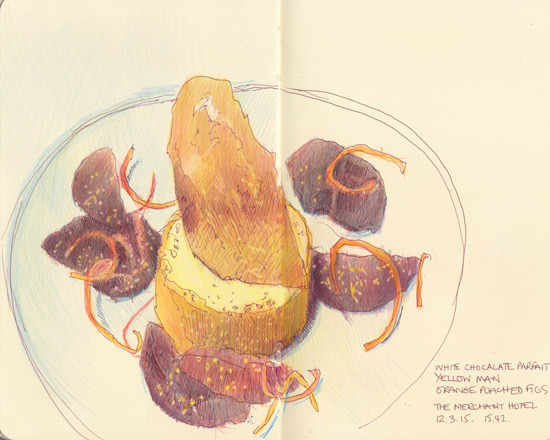 I've got a set of food sketches coming up next - from lunch at The Merchant Hotel on Thursday after my sessions were finished. 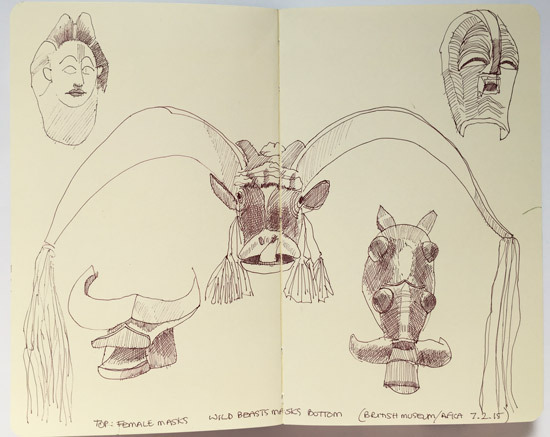 Only a week late this time - here are the sketches from the London Urban Sketchers Sketchcrawl at the Victoria and Albert Museum last Saturday. 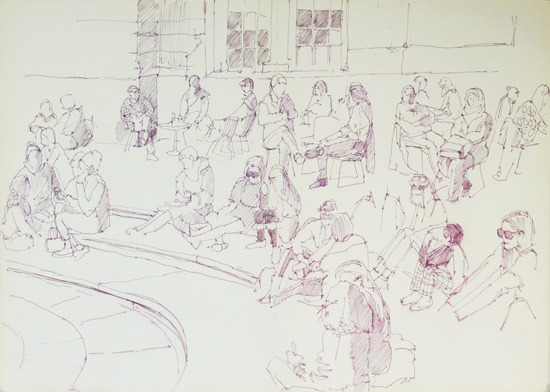 It was so sunny that I say in The John Madejski Garden - the courtyard with a pool in the centre of the Museum - all afternoon drawing people sat in the sun. I started with the chap sat next to the external corner of the building (top left) and then worked my way across the page relating one person to another. Of course they were never all present at the same time as people came and went as I drew - and some of them moved rather a lot while I was drawing! Which accounts for why some are half finished! 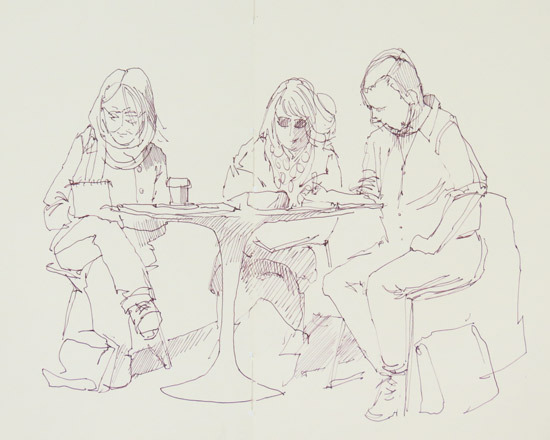 I also drew some London Urban Sketchers. On the left is Jean Edwards (a drawing a day) and on the right is Pavel Miller. 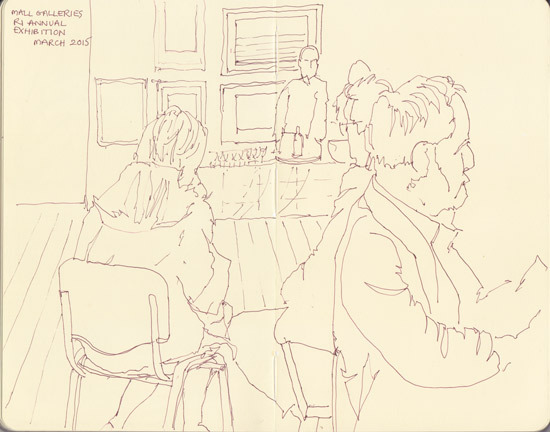 You can see what Jean and Pavel were sketching in the Tweets below my sketch - they were both sketching the architecture of the V&A at the time. I always seem to be late posting sketches from Sketchcrawls! 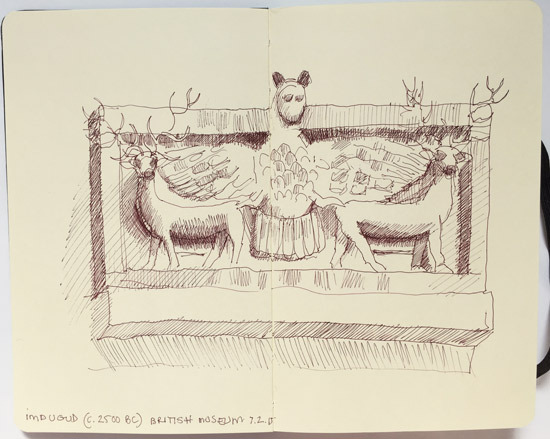 These are three from last month's Urban Sketchers London visit to the British Museum. I avoided the architecture and stuck with the artifacts in the cases and a rather splendid sculpture above one door. Some of them are very difficult to draw - but I'm not showing you my failures! Not quite sure what the name is for a statue above a door This is Indugud (c.2,500BC) - it looked like an eagle and stags to me but it was about 25 feet up in the air! 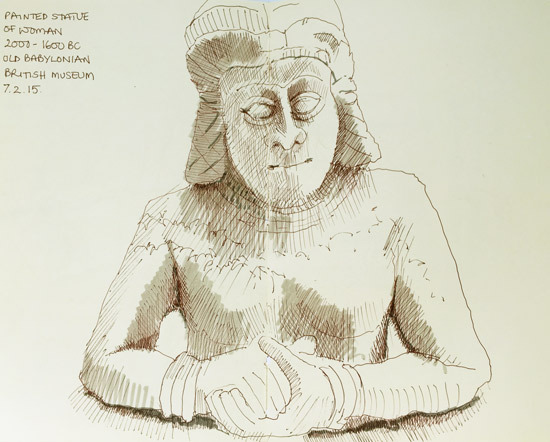 Today there's another sketchcrawl at the V&A Museum in South Kensington which I'm leaving to join now. It finishes at 3.30pm so still time to get along and join in! Meet me and get 'Sketching 365' signed at the Mall Galleries TODAY! You've got a few hours to get up to the Mall in London and catch James Hobbs and me, see our sketchbooks and get your copies of Sketching 365 and Sketch Your World signed by us! There is even a reduced price deal for anyone buying both books before 4pm today. We're also very happy to answer any questions you may have about sketching and how you are getting on with your own sketches. We'll be around until 7pm after which I think we might be joining the Pastel Society's Art Event evening. 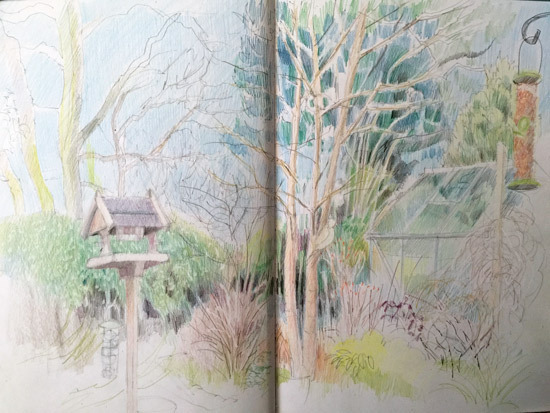 pencil and coloured pencils in a Stillman and Birn Zeta sketchbook 12" x 16"
I've been drawing my mother's garden in Cheshire for some years. I sit next to the French window into the garden and have the benefit of armchair, warmth and cups of tea while I draw the scene outside the window. Sunday, 1 March 2015 - St David's Day - is nominally the first day of Spring in the Meteorological calendar - or so the BBC weatherman informed us! The the weather was very good in the morning and very dim and grey in the afternoon! Of course, the major benefit of staying in one place is that I can get up the next day and continue a morning sketch from where I left off the previous day. However, by midday, as we travelled to catch my train from Crewe, the weather had turned to sleet! This isn't finished and I might tweak it a little bit more - but I'm loath to do too much now I'm back in London and don't have the garden in front of me. A Cheshire Garden in July (July 2011) This one features as a large image on the Section Title Page of my new book 'Sketching 365'. If you're wondering about the size of the bird table it moves around depending on the season and weather. In the winter months it's always very close to the door into the garden so Mother can feed the birds easily.